I’m sorry. I’m just getting that apology out of the way now, because I’m going to have to make the inevitable Dark Souls comparison in this review and I know everyone is sick of that nowadays. So, Dandara is a Soulslike is it? Not exactly. 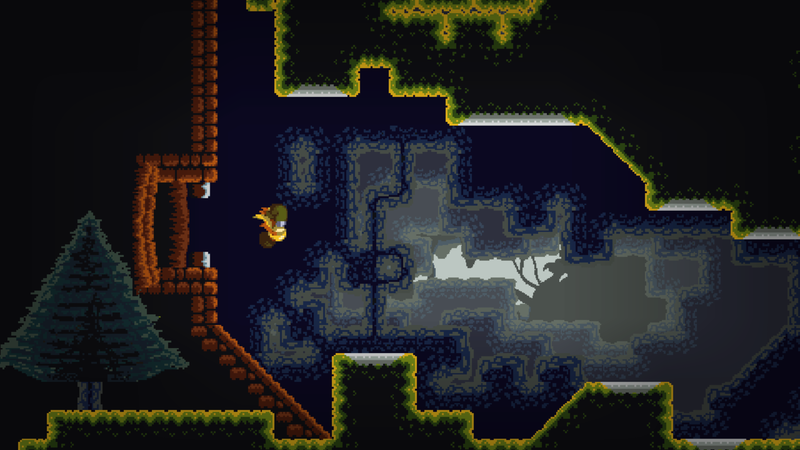 It’s more of a Metroidvania (yes, I know you hate that comparison too, sorry) with heavy Soulslike tendencies. Let’s set the scene before we delve into the bits for which you’ll undoubtedly begin hating me. The world is a beautiful, peaceful place (already telling you that this is pure fantasy, although it does have some roots in real history, paying tribute to a Brazilian anti-slavery warrior from the 1600s) until something known as a ‘golden idea’ shatters the balance. In this case a literal bridge between Creation and Intention is destroyed, and oppression sweeps across the world. 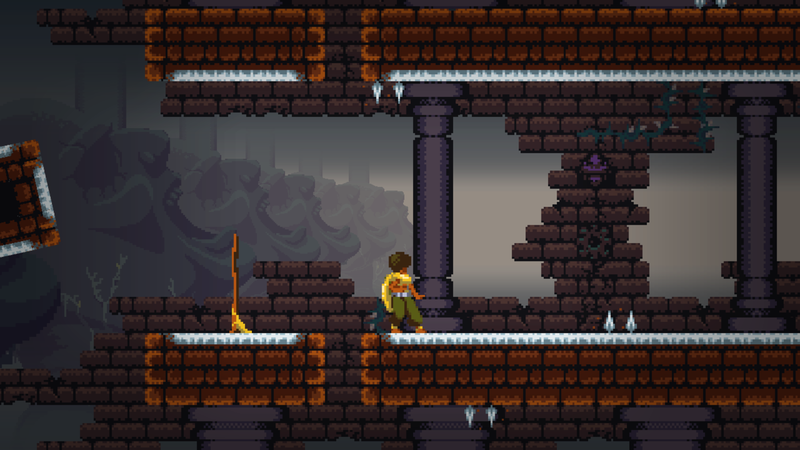 Creation steps in and Dandara awakes, ready to save the day. That’s about the extent of the story really, with only minor extras hidden in the extremely rare NPC encounters dotted around the game world. It’s not really about the story though. Much like other games mirroring the styles of Souls or Metroid, it’s about the exploration and the feeling of accomplishment when you finally find your way into that new area you couldn’t reach earlier, or when you beat that boss you’ve been losing to for the last hour. The world of Dandara is gorgeous, with its astounding pixel art and the sheer variety displayed in its environments, you will want to see more of the place. Even the various creatures that block your path are superbly designed; from the Egyptian-like dog-headed soldiers of the first couple of areas, to the more bizarre angular fellows later on, with a mouth full of teeth where their stomachs should be; everything looks like it belongs in either dream or nightmare. You explore the various locales of Dandara in a unique manner, I must say. There is no running and jumping a la Metroid, instead our heroine leaps from surface to surface. You cannot move along a straight line for some unknown reason, you must use the left stick to aim at each specified surface, not unlike aiming in a twin-stick shooter, and a tap of the A button (on Xbox at least) has Dandara leaping to her target with incredible speed and precision. It’s cool at times, but again, there’s no explanation as to why she can’t simply run along a surface, or why she can’t land on that patch of grass, only the rocky bit next to it. It’s also rather awkward, because the aiming sometimes decides that you were pointing at the ledge next to that enemy, instead of the doorway nearby, leaving you open to damage. This kind of problem never goes away. No matter how much you improve in your reflexes or skill throughout the game’s seven or eight hours, at some point the aiming will send you flying right into a projectile or a trap of some kind. This problem is compounded by the need for speed, especially when the brutally tough bosses come into play. These boss fights should be exhilarating; the first one is at least, as you launch yourself from wall to ceiling to floor, avoiding the massive fists of the giant M. Bison lookalike, before chasing his disembodied head through a corridor of nothingness, platforms appearing as you close in on your prey. It’s a fantastic boss battle, one that should have set the tone for the rest of them, but nothing else matches that. Especially the final boss, which is simply a war of attrition. 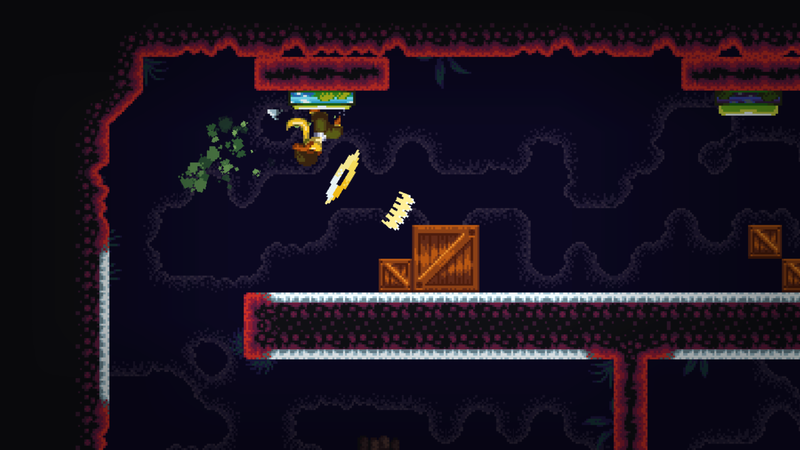 More problems appear once you reach the final third, when enemies are appearing all around you and there are turrets following you everywhere, able to shoot through walls. It turns the game into a bullet hell experience, only without the precise controls needed to navigate them properly, and you end up frustrated. When death finds you, and it will (a lot, often as a result of the awkward controls) the Dark Souls mechanic comes into play, leaving your experience behind in the spot where you died. If you die again before reaching it, all that XP disappears forever, but collecting it restores the amount you lost upon death. You can spend your XP at camps; upgrading your health, energy (used to power various special weapons and abilities gained as you progress) and how much of those are restored when using recovery items. Choose very carefully, however; having lots of hearts is good and all, but what use is that when you only recover two at a time? This is a mistake I made, making later areas more of a slog than necessary. When Dandara does click, which it does now and again, it shows glimpses of the potential hidden within. The level design is fantastic, making you think about the path you take and just how you’ll fight (or avoid) each enemy, and even how you’ll make your way to that secret chest. Chests are important as they often contain extra recovery items, which refill every time you sit at a bonf- I mean, “camp”, or even new weapons. 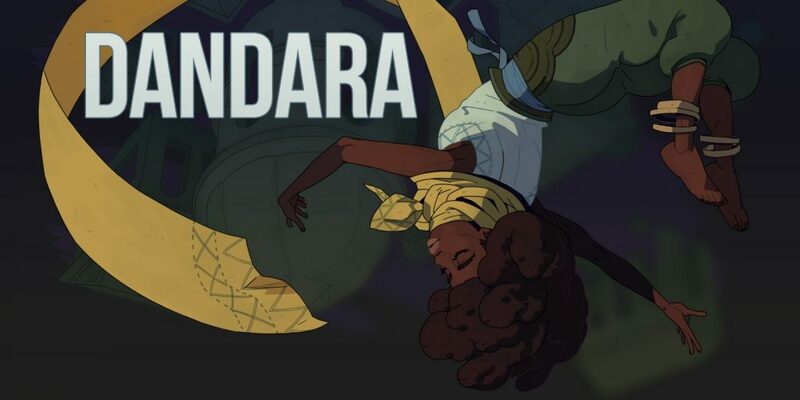 The way the camera swivels around when you enter each room will throw you off, confusing and disorienting you as you consult the map for the hundredth time to get your bearings, but that’s all part of the style and charm that Dandara sometimes oozes. It’s just a shame that you often come crashing back down to earth, when the game inevitably struggles with its balance of difficulty, speed and controls. With its unique movement idea and some wonderful level and visual design, Dandara should have been the latest indie hit to come out of early 2018, but its control issues and the inability to decide exactly what kind of game it wants to be, end up holding it back. It’s still a good game, but it never really feels rewarding beyond that first boss, which leaves me struggling to recommend it. Unless you like feeling frustrated, of course; then go for it. Dandara has some interesting ideas and great visual design, but it rarely feels rewarding. It drags in the middle and the final third just frustrates, sucking the fun out of the experience.